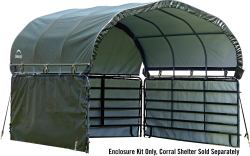 Get extra protection for livestock, horses and field animals with the perfect Corral Shelter accessory. The Corral Shelter enclosure kit offers added coverage for corral panels and provides additional shade protection for your Corral Shelter unit. The perfect added feature for your Corral Shelter, this enclosure kit is compatible with all Corral Shelter units. Box contains: one end panel in green and three side panels, lacing rope for easy installation, a complete hardware kit and easy step-by-step instructions. *Corral Shelter not included. Corral panels and gates not included.